Desperately in need of cash, the U.S. speedskating team has turned to that living embodiment of everything that is right and good about America: Stephen Colbert. U.S. Speedskating found themselves $300,000 short, after their Dutch bank sponsor declared bankruptcy. With mere months before the Olympics, along came a hero. With Dan Jansen as his guest on last night's show, Colbert announced that he would step in. 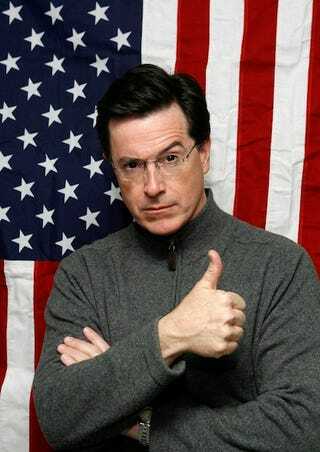 Skaters will wear "Colbert Nation" on their hoods, and we should expect some offbeat promotions in the near future. Notice it's "Colbert Nation" and not the actual show doing the sponsoring. That's because there's no cash in the deal; it'll be fans of the show who provide the material support. There's a fundraising link on his site. Nice, but I'm not sure pay-what-you wish sponsorships are the future of sports. I believe In Rainbows has made about $78.50 so far. It still tragically involves a lot of Canadians," Colbert said. "It's kind of unseemly how many Canadians I'm going to have to be dealing with."